On Saturday April 13, 2019 we were at The White Barn in Prospect PA. The event was a wedding ceremony and wedding reception for Jill and Gary. Jill and Gary were married in front of the pond at The White Barn. Guests began arriving at The White Barn at 3:30 pm as we played prelude music prior to the start of the wedding ceremony. The ceremony started promptly at 4:00 pm and was presided over by Reverend Chris Schilling. 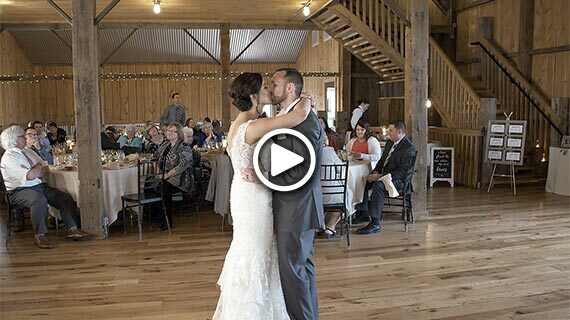 After a 15 minute ceremony, guests transitioned to the lower level of the barn where they enjoyed cocktails and appetizers as the bridal party posed for photographs. At 5:30 pm we formally introduced the bridal party into the barn and then toasts were offered by the best man and maid of honor prior to dinner. Dinner was prepared by the culinary staff at Medure’s Catering and was served buffet style. After dinner, Jill and Gary cut their wedding cake and then shared in their first dance together as husband and wife to the song Perfect by Ed Sheeran. Next, Jill danced with her father and then Gary danced with his mother before we opened up the dance floor. Throughout the remainder of the evening, guests danced to the sounds of DJ Pifemaster until the wedding reception ended at 9:30 pm.